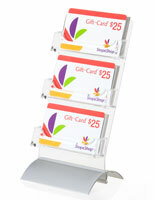 These Revolving Gift Card Holders Feature Smooth Rotation! The Black Finish and Clear Pockets Create a Professional Presentation Every Time! 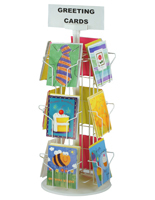 These Revolving Gift Card Holders are Equipped with a Signage Display! These revolving gift card holders are space-savers! 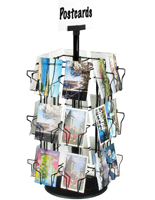 The countertop racks are the perfect displays for point-of-purchase areas. 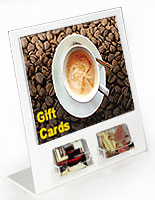 Each of the revolving gift card holders is made out of black acrylic for a stylish and modern appeal. In addition, the pockets are crafted from a clear acrylic, which provides an unobstructed view. These revolving gift card holders have (9) different pockets, (3) per side. As a result, they can fit up to (100) pre-packaged gift cards. 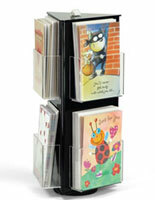 The revolving gift card holders are suitable for certificates measuring 4" wide and 3" tall. Each of these display fixtures is outfitted with a sign gripper at the top. 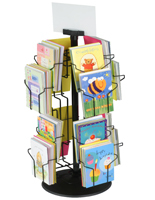 This feature of the revolving gift card holders allows users to create and exhibit their own signage. When developing signs, thicker cardstock material is probably most effective. 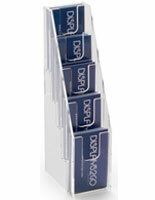 Place these revolving gift card holders on a retail sales counter or table to grab more attention. Impulse purchases are essential to many retailers bottom line, so why wait? 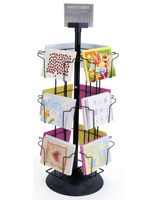 Get these revolving gift card holders today and save with low, wholesale pricing.